This revised and updated edition reflects the changes that have taken place within the field of leisure and recreation management in recent years. Issues such as social inclusion, cultural strategy, exercise for health have risen to the top of the policy agenda. Commercial pressures, changes in the voluntary and public sector and emerging leisure professions such as sports development and playwork are all profoundly influencing the professional landscape. Leisure and Recreation Management is the only book to cover leisure history, key leisure concepts, trends, provision, management practices and operational issues in one comprehensive volume. 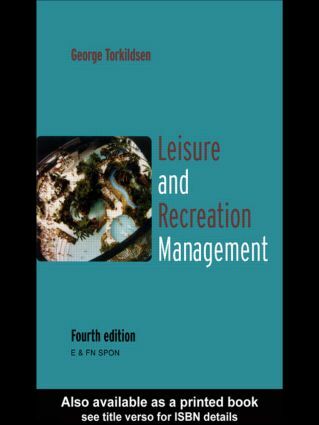 Exploring every key concept and innovation, and with more student-friendly textbook features than ever before, Leisure and Recreation Management is essential reading for student and professional interested in the theory and practice of managing leisure and recreation services and facilities.